your life has been touched by Rotarians. The Rotary name is derived from the early practice of rotating meetings among members’ offices. Today, most Rotary clubs—including the four in the Comox Valley—have regularly scheduled meeting dates, times and places. Rotary’s early emblem was designed in 1905. It was a simple wagon wheel (in motion with dust) designed to represent both civilization and movement. The present emblem, 24 cogs and six spokes, was adopted in 1924. A keyhole in the centre of the Rotary wheel was added to signify usefulness. There are four Rotary Clubs in the Comox Valley, all of which are part of Rotary International’s District 5020, which geographically encompasses all of Vancouver Island and western Washington. There are more than 5,000 members in almost 90 clubs in this region alone. District 5020 is one of 530 districts of Rotary International (RI), which has 1.2 million members in 34,000 clubs worldwide. In 1974, Courtenay Rotary sponsored the formation of Comox Rotary. One of the most notable projects of this club is the construction of the d’Esterre House Seniors Centre in 1976, its expansion in 1994, and the ballroom renovation in 2011. Today, their most popular fundraiser is the Canada Day Ducky 500 Race, which celebrated its 24th anniversary this summer. In 1987, the Courtenay Club supported the formation of the Rotary Club of Strathcona Sunrise. With their meeting time set at 7:00 am, this club is great for early risers. Historically, the Strathcona Sunrise’s fundraisers have included food booths and beer gardens at local festivals and events, and in recent years, Strathcona Sunrise has held a signature fundraiser with the sale of Skyrocket Fertilizer. 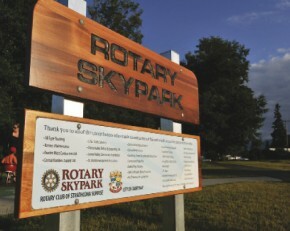 Funds from Skyrocket sales went toward the building of the Rotary Skypark, the Valley’s first universally accessible park. In 2005, the RI’s centennial year, the Rotary Club of Cumberland Centennial was formed. Their first major fundraising event—the Extravaganza Italiana—was held that October and raised $20,000. More than 300 people attended the event in 2010, netting Cumberland Rotary $46,000 with some of the profits donated to the Comox Valley Hospice Society. In total, Comox Valley Rotary clubs worked diligently and raised a collective $250,000 over three years for Hospice. This project was spearheaded by Courtenay Rotary but supported by all four clubs. This year, all four Comox Valley Rotary clubs are working together again, this time to support Rotary International’s 26-year long pledge to immunize the world’s children against polio. Accepting a challenge from the Bill and Melinda Gates Foundation, RI is committed to raise $200 million for vaccines for the four remaining countries where polio still exists: Afghanistan, Pakistan, Nigeria and India. Comox Valley Rotarians will do their best to help RI reach this target. Traditionally, anyone wishing to become a Rotarian must be an upstanding member of the local business community (or a retiree) and be invited to join by a current member. If, however, you are new to the community or don’t personally know anyone in Rotary, you may contact one of the groups listed below and put your name forward for consideration. Potential new Rotarians are encouraged to attend a few meetings as a guest in order to better understand the commitment and scope of the association. Where you live in the Comox Valley does not dictate which club you may join; people generally choose a club based on the meeting location and time that best suits their own schedule. If you have been protected from the rain at a bus shelter in Cumberland, sovaldi taken a leisurely stroll along the pier at the Comox Marina, enjoyed an outdoor concert in Simms Park or listened to the sounds of children’s laughter at the new playground at the Courtenay Airpark, your life has been touched by Rotarians. and the environment and region that sustains it. choosing that name because it was easy to remember and it made people smile. It is with that sort of cheerful spirit that this young couple approach life and their work. They take the same positive attitude with them when they engage in the debate about the pros and cons of the proposed Raven Coal Mine. “I would love to make sure that there is something here for my kids,” says Hollie Wood, working their Baynes Sound oyster lease with husband Greg and daughters Roseanna (left) and Jasmine (right). Greg and Hollie—both Islanders, he grew up in Bowser and she on Denman Island—met in 1994 while working at Fanny Bay Oysters for the summer. Hollie had been in the process of switching from studying engineering at the University of Victoria to Malaspina College where she wanted to pursue aquaculture or forest resource technology. Hollie and Greg work the oyster lease themselves, with Greg’s brother lending a hand if they get really busy. In addition to a couple of days a week working on either the beach or the raft farm locations, they make deliveries, take care of maintenance and tackle the paperwork. The Woods’ family life is busy, as their Fanny Bay household includes their two daughters, nine-year-old Jasmine and six-year-old Roseanna, as well as two cats and a gerbil. “The rafts are like our nurseries,” says Greg, explaining the process of growing the tiny hatchery-produced oyster seeds. “All of them start there, they grow really fast on the rafts but the shell isn’t very strong so when you put them on the beach they toughen up. We prefer to let nature harden the shells and the quality is very superior and they last longer in the fridge for the chefs. They admit that breaking the ties with Fanny Bay Oysters and going solo with Hollie Wood Oysters was a scary and stressful thing to do, but, the last couple of years have gone well and they are meeting their business targets sooner than expected. They love where they live and the work they do. They enjoy interacting with their clients—mostly mid-Island restaurants—and developing products to meet their needs. Part of their business plan was to work with the 100-mile diet concept. They both express deep concern for the high level of CO2 emissions and the consequences for the planet their children will inherit if people everywhere don’t start to understand that emissions levels are too high and need to be reduced. “We need to make changes now—yesterday,” says Hollie. “Maybe it has to be forced upon us to make those changes? He points out that the conservation area would be in sync with renowned oceanographer Sylvia Earle’s recent call for more ocean protection. Earle, who is currently an explorer in residence with the National Geographic Society, won the Technology, Entertainment, Design (TED) award in 2009. Award recipients receive $100,000 and the chance to state their wish to help change the world. Earle used the money to found Mission Blue and wished to ignite public support for a global network of marine protected areas. A few hours before making her presentation in Union Bay, Hollie was serving oysters as part of the local Shellfish Festival. Given the choice, she and Greg would choose growing and promoting oysters over public speaking any day. But for the sake of their children and the industry and region they love, they are speaking about their concerns and offering positive alternatives. Their respectful and constructive approach could be essential to bridging the differing visions of the Comox Valley’s future that the mine project is bringing forth. For more informtion visit www.holliewoodoysters.com.